This upper body superset workout will leave your arms on fire! 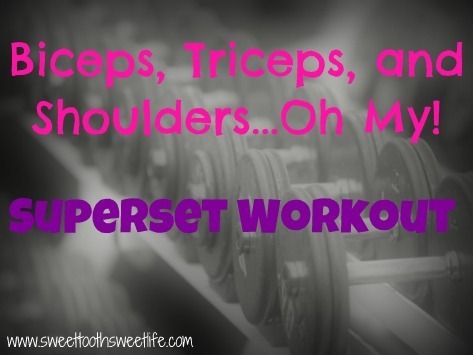 Who doesn’t love a great upper body workout, right? Right! Especially now that the summer months are upon us, I’m pretty sure it’s fairly common for us ladies to want to make sure our arms are lookin’ good in those cute tanks and tees. The workout is made up of three supersets, with each one focusing on a different muscle group. The first move listed in the superset is a balance and stability move; this move utilizes either a Bosu or stability ball and will force you to keep your core muscles engaged through the duration of the exercise. 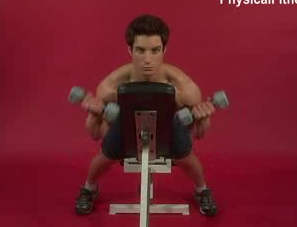 For this exercise you should choose a weight where you are able to perform about 15-20 reps. The second move listed in the superset is a basic strength move. For this exercise, you should choose a slightly heavier weight that will allow you to perform about 8-10 reps while still maintaining proper form. Complete each superset 3x, moving quickly in between each set. Take a few minutes to rest in between each superset before moving on to the next. Have fun sculpting those super hot arms of yours! 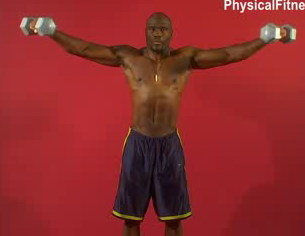 I loved your shoulder workout - this one looks great, too! Love that you added some Bosu moves ... I did a core class today that incorporated the Bosu, and it really challenged my balance!! I love lifting upper body! May be doin' this tomorrow! aaaand today is an arm day. Perfect! ;) thanks! Can't wait to try this! I always neglect working out my arms in favor of legs and abs and I have the upper body strength of a toddler. I love the pictures that you included with the workout!! I will have to mark this one for a future upper body workout. Today, I did a 100 pushup challenge for time and OMG, my chest, arms and shoulders are FRIED!! Courtney, it's good to see the upper body getting some love as well. Firmer arms really do make a difference. Ooh! Looks like a great upper body workout! BTW, guess who I saw in Fitness magazine while I was treadmilling this morning... YOU :D. That's so cool (even though I'm sure it's old news for you). You really give me ideas on what perfect workouts to do for every part of the body. I will do some of these workouts at home.